The new laser based shaft alignment tool, Fixturlaser EVO, is all about evolved simplicity. It's a product without the frills and the bling bling that stays true to our core values: simplicity, user friendliness and innovative techniques. Einstein once said "Everything should be made as simple as possible, but not simpler". The Fixturlaser Evo is a realisation of this principle in a portable laser alignment tool. 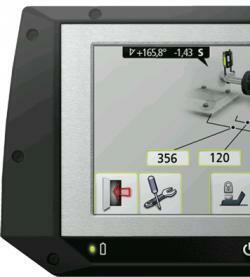 The Fixturlaser EVO offers a compact display unit with a 5” color touch screen. It's slim and nicely balanced, allowing you to hold it in one hand, leaving your other hand free to tap the screen icons and rotate the shafts. It has an uncluttered, clear and color coded graphic user interface that enhances it's ease of use and allows the maintenance professional to concentrate on the alignment process without any added complications. The Fixturlaser EVO offers an extensive shaft alignment software package, including the "Feetlock function" that is useful in base/bolt-bound machine situations. The Evo has a large 30 mm CCD detector which enables the user to achieve unparalleled repeatability together with outstanding precision alignment, regardless of ambient light and measurement environment. The benefit over the older analog PSD technology is unmatched when it comes to filtering and refining the measurement data. Another benefit is our very compact sensor units, these are only 33 mm thick and therefore easy to fit into even the tightest spaces. Fixturlaser has developed an adaptive user interface, i.e. a user interface that actually tells you what to do based on your measurement results. With the VertiZontal Moves feature, they have brought to you one of the most innovative and time saving features in the shaft alignment world. The adaptive user interface shows graphically how much a misaligned machine requires to be adjusted by adding or removing shims at the machine’s feet. When carrying out the measurement, you no longer need to re-measure in between the vertical and the horizontal adjustments during the alignment process. The following horizontal adjustment is promptly carried out with real values displayed. Do you find it confusing when the display screen does not show the machine from the same angle you are viewing it from? No problem, we have a solution for that as well – the Screen Flip. It enables you to see the machine set-up on the screen exactly as you see it yourself. You change sides and at the touch of a screen icon the view on the display changes to suit. One of the Fixturlaser Evo's main ease of use and time saving features. Fixturlaser EVO Laser Shaft Alignment.